February 22, 1832 ground was broken for the canal, which would link Lake Erie at Toledo with the Ohio River at Evansville. Jordan Vigus, Canal Commissioner, Charles W. Ewing, Samuel Hanna, Elias Murray participated in the ceremony. It was completed to Huntington County by July 3, 1835 and by July 4, 1843 was completed near Lafayette, Indiana. It was located where the south end Headwaters Park is now located. and was replaced a couple of decades later by the growth of the railroads. The canal froze in winter and was used for skating and sledding. See a sleigh ride story along the towpath from Fort Wayne to Indianapolis by Eliza Taylor Hanna in short bit of history by Tom Castaldi, local historian, posted December 17, 2012 on Wabash & Erie Canal Park on Facebook. The last boat was seen on the canal in 1882 from the October 9, 2019post by The Landing Fort Wayne on Facebook. Diamond in the Rough...Very Rough is a video of a two-story log cabin tavern/home built in the 1830s siting along old US 24 near Woodburn, at the edge of the Wabash and Erie Canal as it has for more than 150 years. It was the only stopping off point for canal travelers between the Ohio state line and Fort Wayne. Passengers would climb off the canal boat and walk fifty yards to this house for refreshment. By Eric Olsen published January 14, 2014 on WPTA21 ABC TV station21Country video. The Canal boat case: who done it? : not us, we were asleep (~1850) - Canal Society of Indiana ebook on Internet Archive. Canal celebrations in old Fort Wayne - 1916, Public Library of Fort Wayne and Allen County. cn, ebook on Internet Archive. Fort Wayne In Canal Days (1900) ebook on Internet Archive. The Wabash-Erie Canal : Fort Wayne on the old canal () - Public Library of Fort Wayne and Allen County ebook on Internet Archive. May 7, 1900 Fort Wayne News newspaper article posted May 7, 2016 on Indiana News 1 formerly You know you've lived in Fort Wayne too long when... Facebook group. May 17, 1914 in The Journal Gazette newspaper Barge Canal project article was discussed October 7, 2017 on Indiana News 1 formerly You know you've lived in Fort Wayne too long when... Facebook group. Audio: Wabash and Erie Canal featuring Tom Castaldi, local historian, courtesy of WBNI-Fort Wayne by ARCH ( Architecture and Community Heritage). CANAL HISTORY - 1828-1881* from New Haven Area Heritage Association, Inc.
Canal Society of Indiana was founded in 1982. Canals: Towpaths West 1963 video by Indiana University Media Collections Online. Canal history plus dramatization of 1840s life along a canal. A document of the day March 21, 2018 was the 1961 letter explaining the purpose of this video by Indiana U. Archives on Twitter. Capt. Mary Ann Mrs. Martin took over two canal boats by Tom Castaldi, local historian, published Febraury 17, 2017 on Fort Wayne Magazine. Fleeting canal era had impact on Indiana - INDIANA AT 200, A COLUMN BY ANDREA NEAL published July 30, 2014 in The News-Sentinel newspaper. The story of rediscovering the Gronauer Lock, a wooden lock that operated on the Wabash and Erie Canal. The Gronauer Lock was rediscovered in June of 1990 by construction workers working on the widening of US 24 just East of I-469. On page 1 of 4 page article: Canal carried Fort Wayne fortward July 27, 2017, page 2 Canal locks August 3, 2017 , page 3 Hardship marked canal travel August 10, 2017 and page 4 Lock holds keys to the past August 16, 2017 by Bob Caylor originally published February 19, 1991 in The News-Sentinel newspaper posted by Hofer and Davis, Inc. Land Surveyors on Facebook. 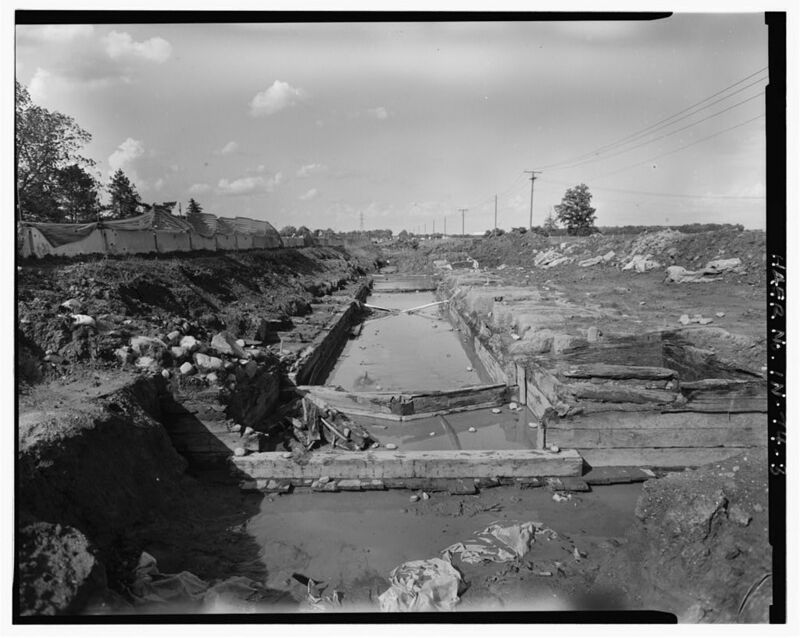 63 black & white photos of the lock at the contruction site are found at the Wabash & Erie Canal, Lock No. 2, 8 miles east of Fort Wayne, adjacent to U.S. Route 24, New Haven, Allen County, IN PHOTOS FROM SURVEY HAER IN-74 at The Library of Congress. How The Landing and Dock Street Got Their Names (It's for the Same Reason) by Shane G.posted on August 10, 2012 on Visit Fort Wayne blog. See The Landing for more information. Internal improvements: Canal put Fort Wayne in focus by Tom Castaldi published May 3rd, 2016 in Fort Wayne Magazine. Lost Birds of Canal Days - a new sign in 2013 at Eagle Marsh lists Prairie Chicken, Carolina Parrot and Passenger Pigeon as birds canal riders may have seen. Need photo of sign - Sue Counterman or Tom White perhaps? See October 28, 2013 photo from Stockbridge Audubon Society shared on Little River Wetlands Facebook page. Map of Indiana Canals 1805-1915 by the Indiana Historical Bureau on IN.gov. The News-Sentinel newspaper had a four page pullout by Bob Caylor published February 19, 1991, or 1992, posted July 27, 2017 by Hofer and Davis, Inc. Land Surveyors on Facebook. Old Aqueduct Club by Tom Castaldi published October 3, 2013 on the History Center Notes & Queries blog. Pirogues are hollowed out from thirty to sixty foot long logs, these tree trunk boats brought families and cargo up the Maumee River from Toledo and Detroit, and returned with furs to Lake Erie in exchange for traders’ supplies. Read more on Pirogue Landing by Tom Castaldi published January 16, 2014 on History Center Notes & Queries blog. 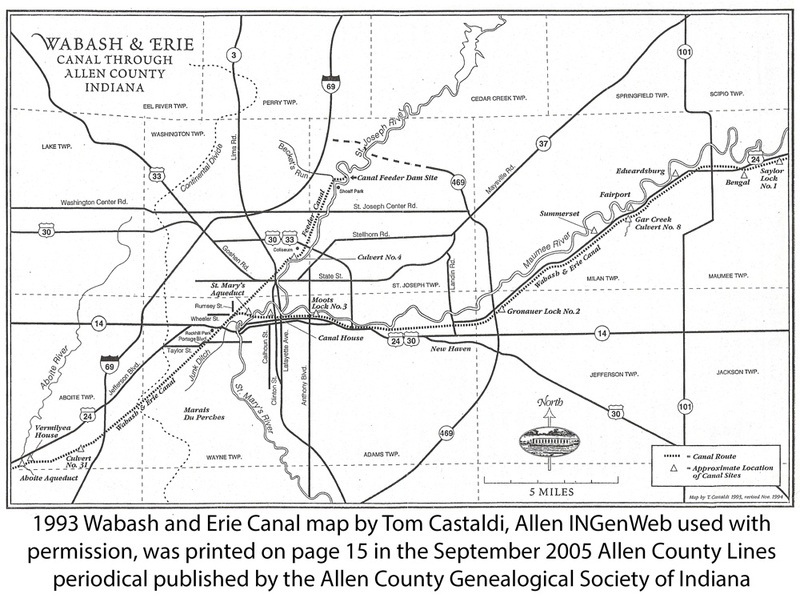 TAKE A DRIVE ON THE ROUTE OF THE WABASH ERIE CANAL THROUGH ALLEN COUNTY by Tom Castaldi published May 9, 2011 on the History Center Notes & Queries blog. The Remains of the Wabash-Erie Canal through Allen County Photos on an archived April 12, 2002 Geocities site on the Wayback Machine. The Remains of the St. Joseph Feeder Canal an archived 04/12/2002 Geocities user generated web page with photos mirrored in October 2009 to the archive site oocities.org. Stop #17 Wabash and Erie Canal on the ARCH ( Architecture and Community Heritage) Central Downtown Trail. Sweet Breeze a canal boat replica was launched in June 2017 on the 3 rivers sponsored by Friends of the Rivers, forfw.org, Facebook. Book Canal Boat Trips at the Outfitters & Bike Shop. See photos in Canal Boat Sweet Breeze is Christened by Ray Steup published June 7, 2017 on infortwayne.com. See short video “Sweet Breeze” sets sail in Fort Wayne by Angelica Robinson published June 6, 2017 on WANE-TV NewsChannel 15. For more information read "Sweet Breeze" Settles In On Fort Wayne Rivers by Julia Meek published June 7, 2017. Sweet Breeze canal boat’s first season on Fort Wayne rivers called a success by Kevin Kilban published October 21, 2017 on The News-Sentinel newspaper. The route to Swift's Park (Robison Park) with photos was discussed July 1, 2016 photos and discussion and Fort Wayne Feeder Canal for the Wabash & Erie Canal discussion with photos August 24, 2015 on You are positively from Fort Wayne, if you remember... Closed group on Facebook. Take a Boat Ride on the Wabash and Erie Canal! by Sara published May 24, 2014 on the Home of Purdue blog. The Wabash & Erie Canal Towpath Trail follows along the path of the former canal connecting various area trails. It is 5.5 miles from Rockhill Park to the Lutheran Hospital campus, weaving through beautiful neighborhoods, scenic marshlands and near areas of commerce. The trail is a bike and pedestrian connection between the Aboite Trails and the Rivergreenway, providing more than 60 miles of connected trails within the trail network. Copied from the Fort Wayne Parks Trails page which also has a map. WABASH & ERIE CANAL, LOCK NO. 2 (Gronauer Lock) original construction between 1837 and 1843, rebuilt in 1849. 8 miles east of Fort Wayne adjacent to U.S. 24 near New Haven discovered in 1992 when building an interchange on I-469. Historic information is included in this 23 page report from Historic American Engineering Record Mid-Atlantic Regional Office National Park Service, Philadelphia, PA.
Wabash & Erie Canal Park on Facebook in Delphi, Indiana and their web site. Wabash and Erie Canal Company Records, 1833–1877 are available from the Manuscripts and Archives Department, William Henry Smith Memorial Library, Indiana Historical Society, 450 West Ohio Street, Indianapolis, IN 46202-3269. Wabash and Erie Canal Groundbreaking marker and The Wabash & Erie Canal marker at the intersection of West Main Street and Growth Avenue. "On February 22, 1832, ground was broken two blocks north for the canal, which would link Lake Erie at Toledo with the Ohio River at Evansville. Jordan Vigus, Canal Commissioner, Charles W. Ewing, Samuel Hanna, Elias Murray participated in the ceremony." Both are on HNMdb.org. Wabash & Erie Canal on Wikipedia, the free encyclopedia.